Metro Exodus Gold Edition is rated 4.2 out of 5 by 1448. 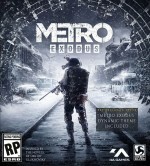 The Metro series has never delivered a runaway hit to elevate it among the most esteemed first-person shooters. But over the course of two critically acclaimed games and a well-executed redux collection, it has steadily gained an audience appreciative of its dynamic gameplay, grounded storytelling, and gripping tension. Developer 4A Games aims to step out of the shadows of cult fandom and challenge for mainstream acceptance with Metro Exodus, taking the action out of the cramped underground and into the irradiated Russian landscape. With a gorgeously realized world and a well-paced campaign, Exodus makes a compelling case for that acceptance, even though some anachronisms keep the story from realizing its full potential. Artyom and crew have left the Metro in search of a better life, and each stop along the voyage offers a new territory to explore, from the flooded flatlands of the Volga River to the dried and dusty former waterfront of the Caspian Sea. Metro Exodus isn't an open world, but rather a series of defined sandboxes that allow players freedom to go where they want and tackle objectives at their own pace. 4A Games' technical prowess is on full display in these dynamic play spaces, with gorgeous lighting illuminating the impressive landscapes. The variety of environments and seasons keep the game feeling fresh throughout the roughly 25-hour campaign, delivering new factions to battle and new mutated beasts to fight or flee. The trip occasionally deviates from open areas in favor of a more straightforward mission that recalls the level design of its predecessors. Metro Exodus' greatest triumph is this well-tuned pacing; no region overstays its welcome, and all have interesting places to explore and memorable characters to meet. The suffocating atmosphere and supernatural occurrences that pervaded your every action in the previous games are sparser this time around, but each region has its own foreboding locations where the jump scares and dread reside. I applaud the attempt to bring more depth to these characters and the world, but the emotional impact of the story's most dramatic moments is often undermined by wooden voice performances. At times, the actors sound like they are listlessly reading words off a script. The lack of back and forth between Artyom and his crew also robs the scenes of their intended weight. Artyom has always been the strong and silent type, but these conversations feel awkward given the length at which many of these characters speak to him with no response whatsoever. When his wife Anna struggles to come to grips with the moral complexity of a situation the crew just extracted itself from, his silence feels downright perplexing. Your choices determine your comrades' fate - not all your companions will survive the journey; your decisions have consequence in a gripping storyline that offers massive re-playability.